This will allow you to customise the Match statistic categories that are captured and displayed for the players within your matches. 7. You will then come to a screen that will allow you to define which statistic categories you would like to capture for Player Match Stats. The fields that are available on the following screen are set for all associations and leagues across your particular sport. Click and drag across the statistic fields that you wish to use from the Available Fields box on the left across into the Selected Fields box on the right. 8. If you’d like to sort your Player Match statistics by one of the particular fields, select it from the Sort drop boxes at the bottom of the screen. 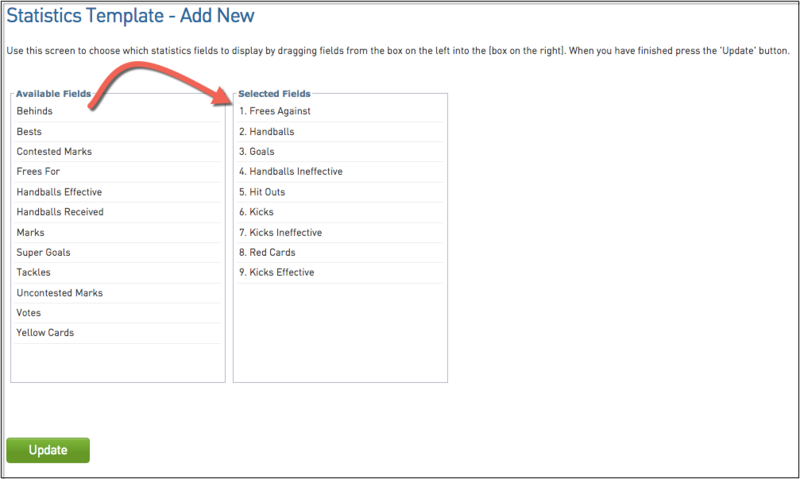 The Player Match Stats template you use will alter the statistic fields that are captured in the Online Result system. 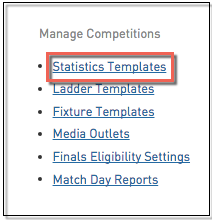 Applying a Player Match Stats Template to a competition needs to be done through the Competition Setup screen. Once you have set up a either a Player Comp, Player Round, Team Match or Player Match Stats Template, you will need to select it from the appropriate drop boxes highlighted below.